Police are continuing their enquiries to establish a motive after a car was set alight in Ballybogey’s Millview Park Court area last week. A police spokesperson said they had received reports of a car on fire shortly before 11pm on Thursday February 9. “It was believed one car was set alight and then caused scorch damage to a nearby vehicle,” she continued. A spokesperson for the Northern Ireland Fire and Rescue Service (NIFRS) said that they had received a call at 10.49pm and the incident was attended by two fire appliances from Coleraine Fire Station. 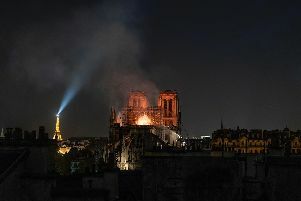 She added that the cause was “under investigation” and that fire crews had stopped dealing with the incident at 11.43pm. Pictures of the blaze show flames perilously close to nearby homes. In daylight, the substantial damage to both vehicles is apparent. A red car, its paint burnt off by the heat of the blaze, is little more than a charred shell. The front and inside of another vehicle has also been completely destroyed in the incident.